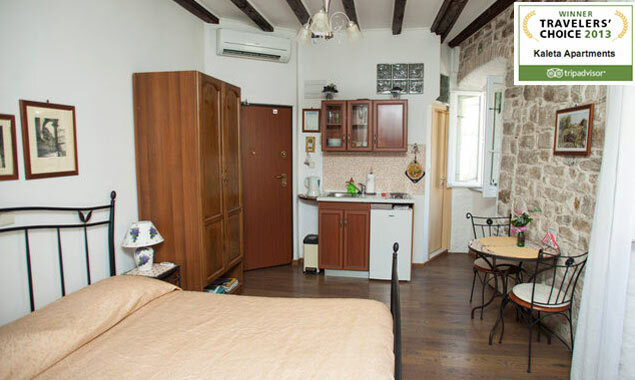 Kaleta apartments is a single room studio apartment, one among the best in Split historical centar and just a stone throw away distance from the Golden gate of historic "Diocletian palace". The apartment is a blend of historical ambience with moder amenities. The apartment is on the first floor of the stone house, a standing witness of more than 500 years. Travel back in time with us, for a while. Come and experience the heart of Split. The location is perfect-at the center of it all. and unlimited internet access, LCD TV with satellite connection, completly air-conditioned andthe apt is well decorated with some local artwork wich adds to the taste. "EXCELLENT LOCATION, FULL OF CHARM"
My husband and I stayed here at the beginning and end of our trip to Croatia. Nino and Negri were attentive and helpful hosts. 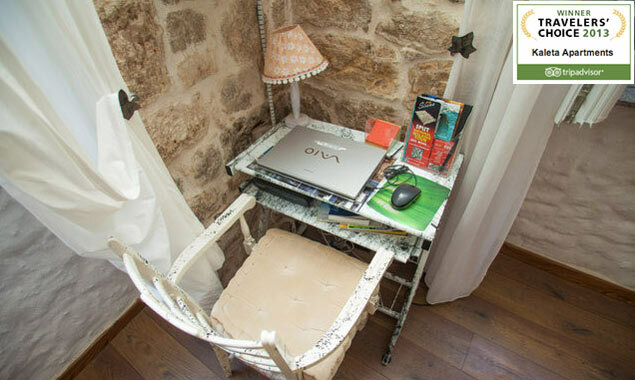 Both rooms we had were charming, with exposed stone interior walls and small touches that make the difference – use of a laptop, four pillows, extra blankets, well-stocked bathrooms and local artwork. The rooms were very well secured, though we felt safe in Split at all times. 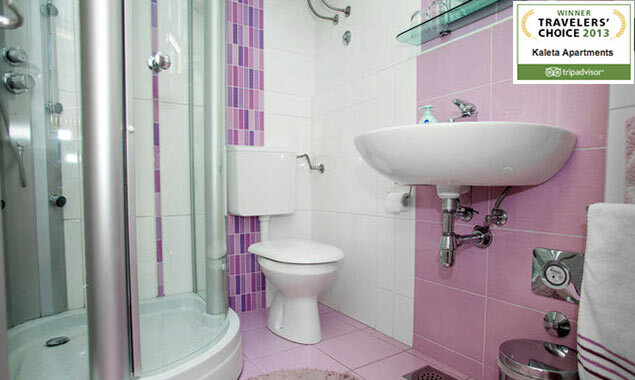 One room had a huge modern bathroom and foyer (good for two couples). The other room, within the palace walls, had kitchen facilities and an ample sized modern bathroom. The locations could not be better, staying within or just steps from Diocletian’s Palace. We loved waking up in the olde town, with all its cafés and stores. Windows and shutters provided soundproofing and darkness, so we had no trouble sleeping. Split was my favourite city in Croatia. One of the highlights for us was watching local people dance (perhaps samba and salsa) to live music on Sunday night in the palace’s main square, Peristil, with people of all ages participating. On our first morning in Split, we also enjoyed a private two-hour walking tour by local guide Ivona Baric, who has lived in the city all her life and has exceptional knowledge of its history. She provided a lot of valuable information to guide our stay. The people are friendly and most speak pretty good English. Restaurant food is great and healthy, with lots of seafood options, grilled vegetables and risottos. Tap water is drinkable, the streets are clean and the sea water is clear. Be sure to head to the beach to the northwest and one to the southeast for different experiences. In mid-September, the water was 24C (80F). We did not encounter a single bug. In terms of restaurants, we recommend Konoba Fife (exceptional value and service) and Konoba Marjan (an intimate indoor restaurant seating just 24). Ice cream, a mix of yogurt and gelato, was delicious and cheap. We were pleased that dress in the city appeared to be smart and casual. Evenings were filled with entertainment on the Riva (the main seaside street). For the best rates, convert your dollars and euros in Split. Very few places take credit cards and most appreciate kunas over euros. Taxi to the airport was 35 euros. No need for a car in a very walkable city. Our apartment (number 5 ) was everything we had hoped for - great location, clean, spacious, tastefully decorated and well appointed - large bathroom, small but adequate kitchenette. We were made very welcome and we were verycomfortable here. Would recommend this accommodation without hesitation. 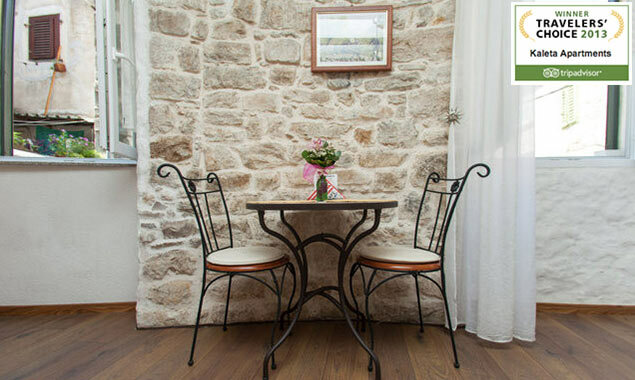 "FANTASTIC PLACE TO STAY RIGHT IN THE MIDDLE OF DIOCLETIAN'S PALACE!" We finished off our trip to Croatia by staying at Kaleta (Apartment 1) in September. What a fantastic location, it is right in the heart of Split actually inside Diocletian's Palace. When you walk out of your door you are right in the thick of it - amongst the buzzing cafe culture of Split. As mentioned before, you worry about the noise in the evening being so central, but the window shutters are really sturdy and block out all the noise so it's not an issue at all! My partner is extremely sensitive to noise - cannot sleep with any at all and she slept with no problem so that's the best test I can think of. 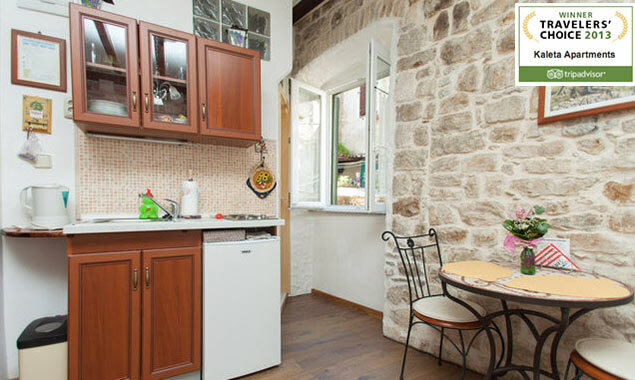 The apartment was brilliant - the bare stone wall of the old town gave it real character. It is spotlessly clean, very well equipped with all the basics you need and very comfortable. You really couldn't ask for a nicer place to stay right in the buzzing centre of Split - couldn't recommend it highly enough and would certainly stay here again! We had an excellent stay at kaleta apartments this month. 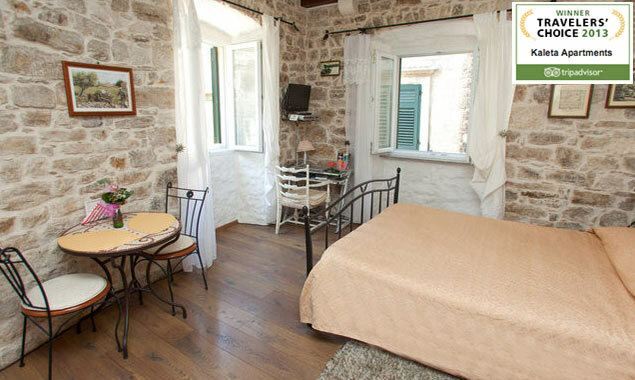 It is in a wonderful location within walking distance of the harbor and all the must-see things in split. The owners are very helpful and friendly with good restaurant recommendations and let us have a late checkout. The room was very clean and comfortable. The shower was excellent! It had air conditioning, a television with cable and even a laptop and wifi. The apartment was also very well decorated and was so nice to come back to after a long day of walking around! I would definitely stay here again. "GREAT VALUE IN SPLIT'S HISTORIC CENTER. WOULD DEFINITELY STAY HERE AGAIN!" We stayed in Apt 3 for a couple nights on the tail end of a two week trip. The apartments are in a 500-year old building along the walls of the palace, right in the middle of the city. We couldn't have asked for a more convenient location. The room was spacious, clean, and well appointed. The bed was also very comfortable. We had no problem meeting up with the owner beforehand and he helped suggest some places to eat and drink nearby. We were also leaving very early in the morning so he arranged for a taxi to meet us just a block away - otherwise we would have been lugging our suitcases across the downtown to the taxi stand. In all these were a great value for Split and are highly recommended. A beautiful place down to every detail. Clean and comfortable, amazing location, had great amenities (large kitchenette with stove). I wish we had stayed longer. The owner was incredibly generous and friendly, and suggested some amazing places to eat. Thank you so much!!! My boyfriend and I stayed at Kaleta apartments in September 2011 and we both agreed that it was a perfect choice. I booked the apartments after good reviews on Tripadvisor. We arrived in Spilt and got a little lost, after enquiring at a local restaurant the lady at the restaurant called the owner and he came and got us. He was very kind and accommodating. The apartment was so lovely. With exposed brick work and cute little furnishings. A fullyequipped kitchenette, comfy double bed, dining table and chairs, and a clean and fully working bathroom, the shower was lovely. Towels and linen provided. There was even tea and coffee in the cardboards. The location of the apartments is unbeatable within the palace walls we only ever had a few minutes walk to anywhere like the market, the port all the lovely bars and café’s. If I had one little niggle it would be the noise from the bar downstairs, but in all honesty we were always so tired after a full day of exploring and after a couple of beers we were normally asleep as soon as out heads it the pillow. But don’t let this stop you staying there I know a few people have mentioned this but to me it was no problem at all. Really nice stay- we booked for Kaleta but were put instead in their new rooms but that was no problem. They're a few minutes walk from the center of the palace. The place was clean, well decorated, spacious. Location was amazing. (parking is pretty hard but we always found spots a little higher on the hill in front of the entrance to the palace) The owner was great - met us at the office where they do reservations and was very nice explaining us how to get around. The price was crazy good - 70 euros per night - a bargain for the middle of summer in croatia. I wish they did confirm the rez through a formal system- I was a little worried it would be a bad surprise upon arrival. Only little negative point was the noise : this street gets very noisy at night and the windows are not great but if you bring ear plugs you should be ok. I was traveling around the Croatia with my spouse mostly staying in apartments rather than hotel rooms, so we can feel that local vibe. Nonetheless Kaleta Apartments provided just that, we came with a bus form Plitvice and we had a map with apartment location. About 2 hours before arriving to Split we gave owner a call and he was kind enough to offer to pick us up, however we refused because we already had a map and we were very exited to explore Diocleatian Palace on our own. It took us about 10 minutes to get from bus station to the apartment where the owner was waiting for us. He was very kind and had some really helpful tips about Split, which made our stay much more comfortable. The apartment was amazing and really me feel like local. Stone walls along with antic furniture gave the whole place really cool look. Also, there was a computer in the apartment with very fast internet connection along with a WiFi that made it so much easier to check my mail on my phone. To sum up our stay in Kaleta was wonderful and I would definitely recommend it to anyone who's planning to come to Split. I just want to thank Kaleta apartments one more time and we will definitely come back here. These apartments are perfectly located in the old town, down some hidden steps which come out by several good cafe/bars. The apartment was better equiped than we could have hoped - tea, coffee and even a laptop included. We had a great time and would stay here again on a return visit.